I woke up all moody in my hotel room at Barbès — Rochechouart, Paris. It had just gone 6am, it was still dark outside. I had to step out. I started walking, determined yet without objective, like James Dean crossing Times Square. Low-rent Boulevard de Magenta was deserted and rubbish-strewn, the discount clothes and trainers stores and wedding boutiques still shut. No sign of my friend. It was a ghost town patrolled by occasional white vans. Nearby, the Moon hung over the Gare du Nord in the cold deep blue sky, as if in a Paul Delvaux painting, but with No Entry signs instead of the naked woman on a couch. Some early commuters were appearing. 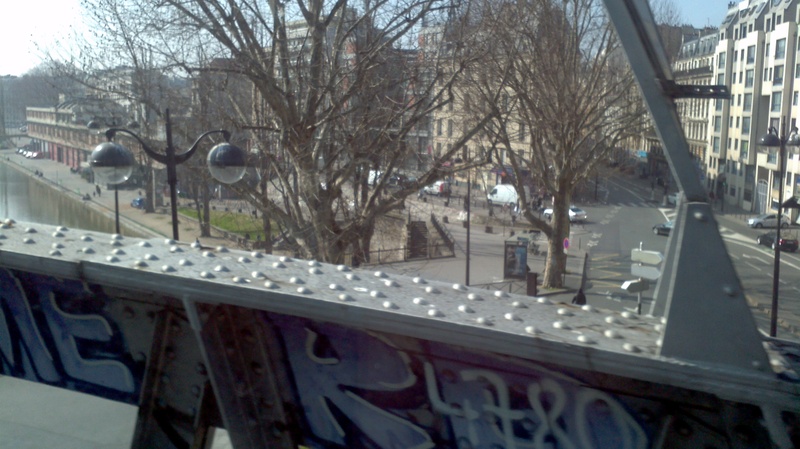 Do I head south, into Haussman’s grand boulevards, maybe towards Place de la Republique? I could see an elevated metro line to the north, past the station. Alors. The commuters dropped away. I was alone on gritty Boulevard de la Chapelle, heading east. A chain of iron bridges carry the Metro down the centre of the road, big stairs between weighty stone walls leading up to stations- La Chapelle, then Stalingrad. Occasional neon shone in the shadows of the sidewalk. Buildings dropped away as I crossed the wide rivers of rail that flow northwards from the Gare du Nord, then a little further on, from the Gare de l’Est. Below, trains slept under floodlights. Above, the slick modern Metro line 2 trains were already on the move on their hard grey iron bridges. They pass, silence returns, and the bridges are still again, black-and-white industrial photography materialised. Beyond them, opposite a hostel called Peace and Love, the purple-fronted Pointe Lafayette sits above a canal on a corner. I sat there thinking, with a café creme and map, the only customer this early. I had skimmed the edge of a different Paris, one near the edge and not in the tourist guides. It was a quarter distinguished by the rivers of rail from the grand stations, and bounded by other transport corridors-a metro line, a canal, a boulevard, an urban freeway. Transport brings all sorts of people to the city- tourists, commuters, those with appointments- but it also provides niches for peripheral people to settle. Behind rail termini lie backwaters that are cheap and away from attention. 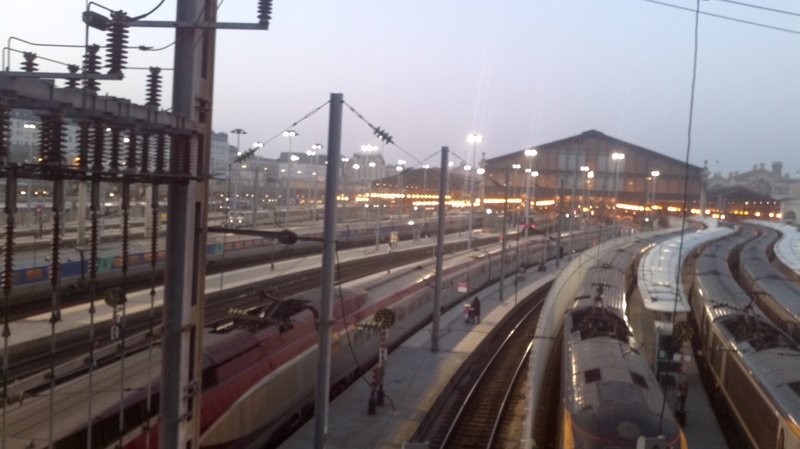 The area behind the Gare du Nord and Gare de l’Est must be such an area. It called for a flaneur to map its psychogeography. Line 2 crosses after emerging at the top of Boulevard Magenta in the 18th arrondissement. 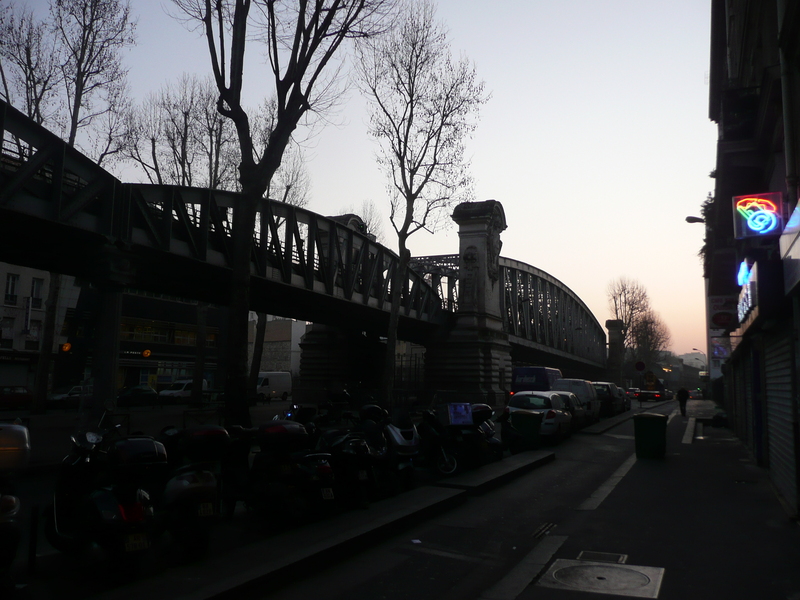 It skims through the townscape eastwards, curving across the Jaurès junction at the 19th and 10th’s western edges, before diving underground again into Belleville (which itself was once Chinatown). The line was extended this was in 1903 and is Paris’ own version of a New York-style El, or elevated local railway. The urban freeway is to the north. The Boulevard Périphérique is a cordon sanitaire around the city of Paris, a ringroad with enough lanes to be American. Beyond it lie the banlieues– a vast ring of social housing, alienation and communal tension. In 2005 they erupted into rioting and the anarchy went national. 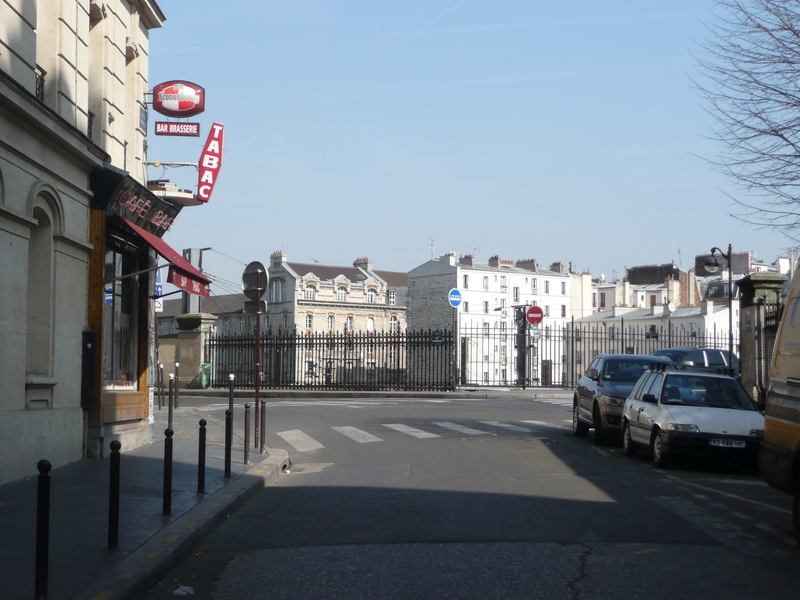 At Place de Clignancourt, on the northern edge of the 18th, I was ready to cross into the no-go lands of burnt-out cars and gangland menace. 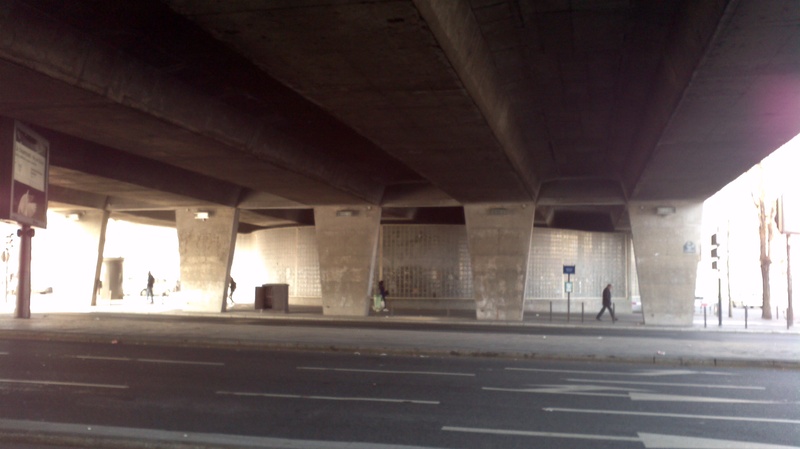 The Mayor of Paris had kindly placed an indestructible automatic concrete loo under the Périphérique flyover, perhaps for anyone shitting themselves at the border. I was disappointed- beyond the loo, Saint Ouen Ouest is a like a French village, small houses and local patisseries, and on the road out of town, used tyre businesses. Au-dela de la barriere, la plage? Still, social housing estates do descend into Paris proper. Look north up the banks over the grand rail lines’ embankments and you can see tower blocks behind the tenements, like boys at the back of the class. 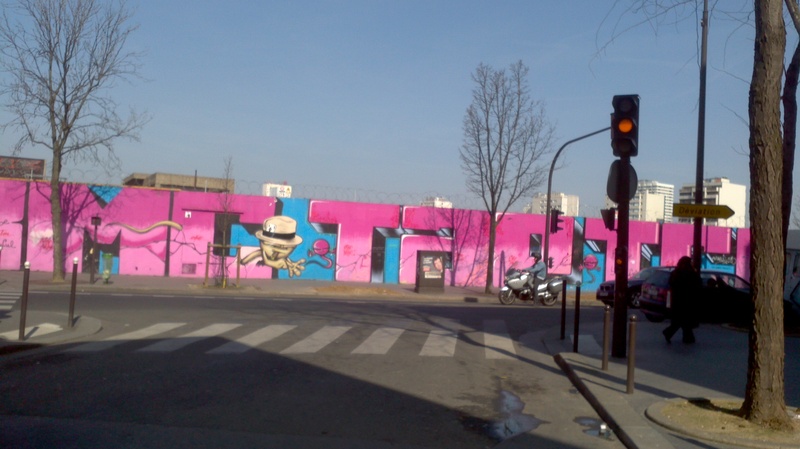 On Rue Ordener, they peep over a screen of exuberant mauve hip-hop lettering. 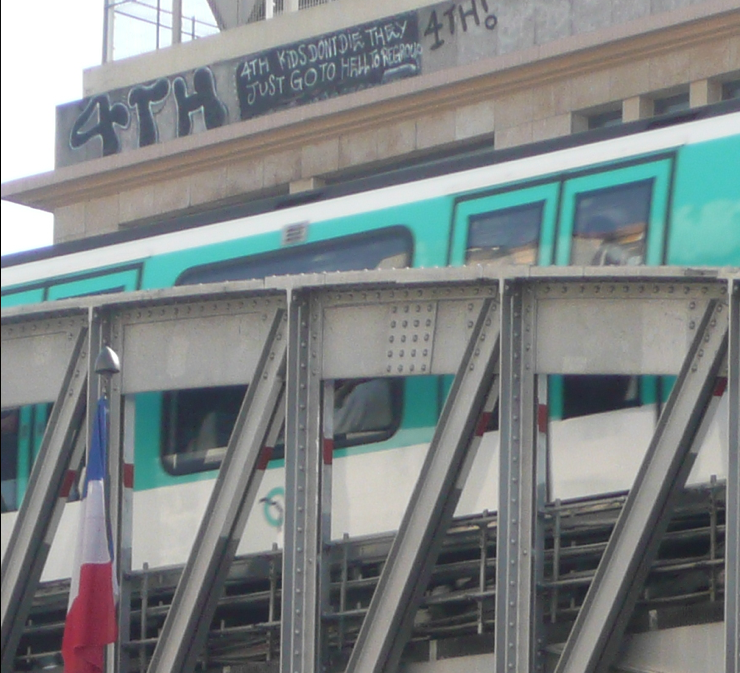 4TH KIDS DON’T DIE THEY JUST GO TO HELL TO REGROUP, proclaims a roof ledge, just above a French tricolor. The hood feels easy in the global language that French lost to. But most of the inner-city graffiti is tired. When it fades into the grey ironwork along the bridges of Line 2, it’s hard to feel the rebellion. On Rue de Tombouctou, a corner brasserie complete with TABAC sign faces railings above the Gare du Nord’s river of rail. It feels like a timeless urban France at the edge of the world, even though you can see the tenements beyond, and the men passing slow time inside are Arab rather than Gallic. This area is full of streets where the only sound is often the rumble of trains, but the very next street can come alive with boulangeries and phone shops, white vans and mopeds, and voices- African, Arab, Indochinese and Indian. Back towards Montmartre, the area is called Goutte d’Or, and it bussles with local life, a melting pot of peoples from distant lands that is new yet distinctly Parisian. On Place de la Chapelle, the friendly Mac Ben eaterie has picture menus in lightboxes above the counter. It ain’t la gastronomie francaise, but the food is tasty- chicken, felafel, kebabs, that sort of thing. And there’s an extra as you finish eating from your tray- sweet tea is brought. Water edges the area to the east. At Place de Stalingrad, you can climb an embankment and look across a wide, tranquil stretch of water, the Bassin de Vallette. Locks connect it to a canal, which passes beneath the roads and Metro bridges of Jaurès, to run south into central Paris along the Quai de Valmy. At night, 20-something Paris bobo (it means bohemian-bourgeois) types descend a ramp to the canal by the Pointe Lafayette bar. There’s an industrial building down there that’s now one of the Usines Éphémères– part music venue, part art centre, part hang-out bar. A DJ on a catwalk over the entrance plays stuff like Velvet Underground to a big space with pop paintings of friendly aliens on the wall. 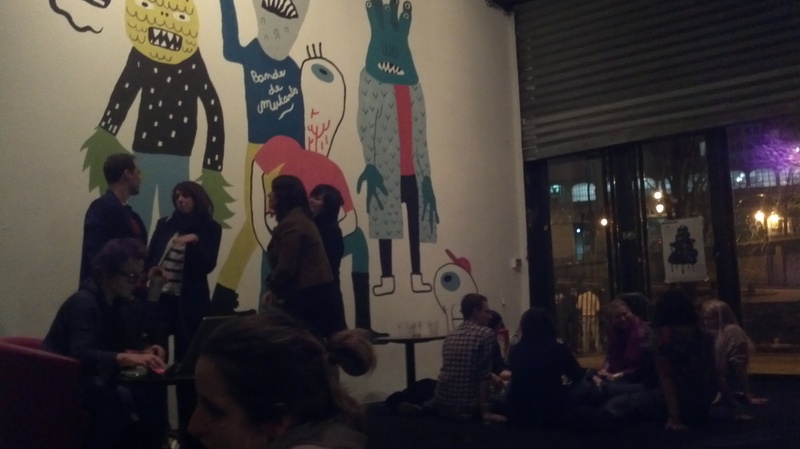 You can sit on the floor and people-watch, or step outside to the waterside enclosure and get talking with types who like music, work in media, or have a creatve project on the go. Artists and piss-artists become indistinguishable. Every now and then, a fire engine from the fire station next door emerges and accelerates right by you along the quay, emergency horns shrieking and blue lights flashing (giving it the twos’n’blues, as les flics britaniques might say). It passes and the conversation resumes, barely paused. After midnight, some of the crowd climb to the Metro and fill the midnight trains, heading home, or to later nightspots like Pigalle, a few stops down the line. This part of the behind-the-great-stations area, around Stalingrad, isn’t so much immigrant as emergent-alternative. It could flip into up-and-coming any day, and then developers would move in to clean up. New housing is already going up beside the railways on streets like Rue Pajol- one project, the ‘Green One’, taps into the marketing power of English. For the moment, the area lies low on the radar screens of wholefood and green tea lifestylers with careers. It hints at something more genuinely bohemian. On Rue la Fayette, a new retro clothing shop has opened that could have been beamed in from Camden Town. A few bobo coffee hang-outs would be cool, but it sure don’t need any urban ‘regeneration’ schemes. If London is a power-dressed female chief exec who knows how to party, Paris is like her secret twin sister, but raised by another family. She is smart and cultivated and chic, and she shows off and flirts and makes you fall in love with her, but she has many secrets. Sometimes, the secrets are as enchanting as the public image. The world behind the Gares de Nord and de l’Est is just one of her many secrets. I am a London-based writer interested in art, architecture, the future and more. I am the author of three non-fiction books. Published articles online appear on www.herbertwright.co.uk. This entry was posted in Uncategorized, World Cities and tagged Boulevard la Chappelle, Gare du Nord, Goutte d'Or, Mac Ben, Metro line 2, Paris, Place de Clignant, Pointe Ephemere, Stalingrad, Usines Ephemeres. Bookmark the permalink. and complex on sites I come upon on http://herbertwright.wordpress. It’s certainly helpful to examine writing from fellow authors and use something from other websites.